What an awesome project! Love how you brought everything together. These are so cool! 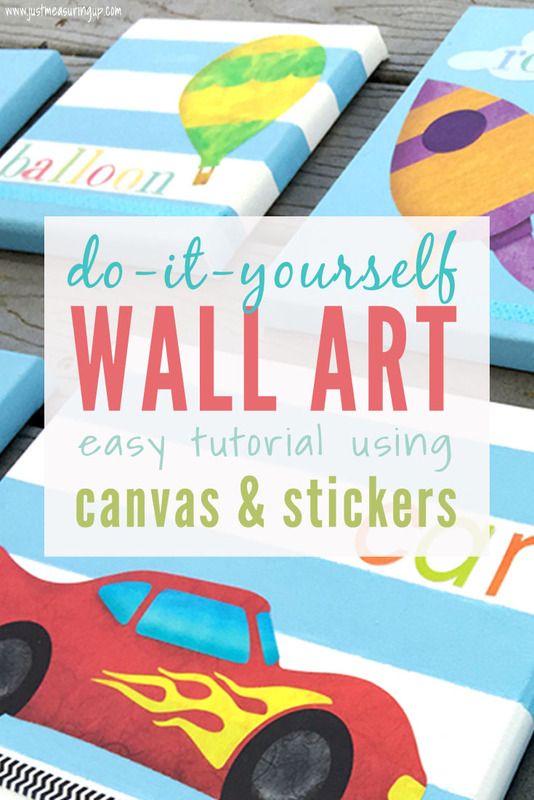 I love how you took simple stickers and upcycled them into wall art! Fantastic Job, Eileen! Very creative! I’m sure your son would be excited by your creations. The washi tapes were a marvelous addition to the designs. I love the stickers from My Wonderful Walls – will have to check them out. The addition of the lettering was also superb – good luck with his spelling. Looking forward to seeing more of your projects. These look fantastic! I’m amazed at how easy this is to do yourself! I’ll be using this as a guide for some ideas I have of my own. 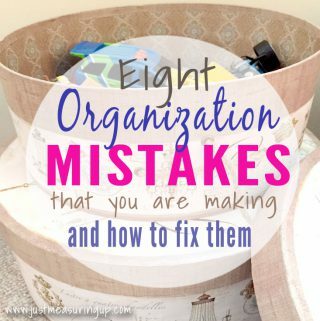 I will definitely be sharing this with my friends of varying craftiness ability as it seems easy enough for anyone to do yet intricate enough to get as masterful as you want! Great stuff! Thanks Danielle! 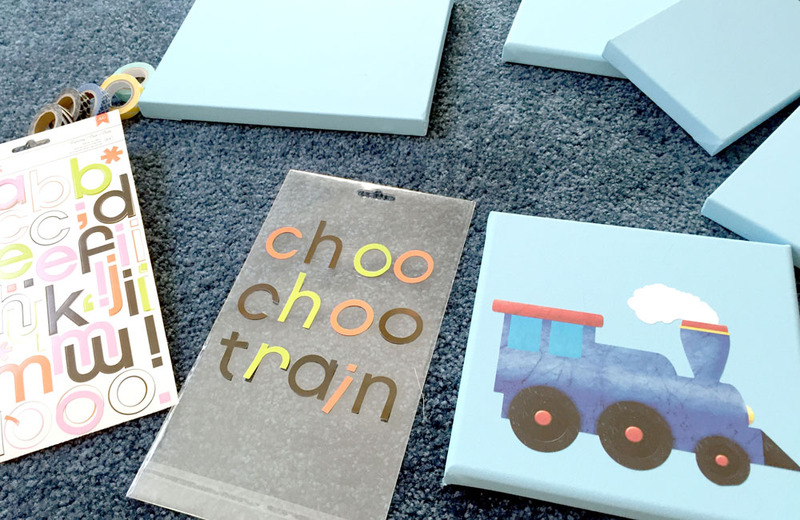 These are perfect for kids rooms – and so easy to make 🙂 Yes, the white paint definitely made the perfect stripe on canvas! Oh, my, these are the cutest! I agree it is hard to find stickers that aren’t cartoons. These are so cute! I love the striped canvases! What a fun way to decorate! Or even have a small play date and let little ones create their own masterpieces. Thanks, Stephanie! 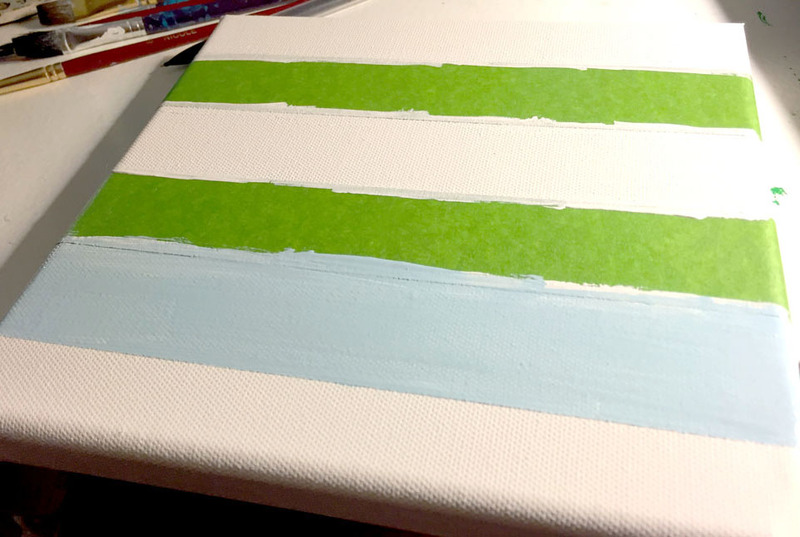 Great idea:)) I did let my little guy help paint the stripes which he loved! Thanks Jess – will do! Hey this is Jessica from itsamomslife.blig and I followed you through the Inspire Me linky party. I love this idea for my son’s bedroom. I think it would be a cool idea to add to my son’s room. I’m going to see if they have other items as well. Hi Jessica! Yes they have tons of awesome decals. The quality and selection are great! And they have stencils and decals that are non-kid related too! Thanks Tif! 🙂 Our little guy loves them! So cool!! We love making canvases over here!! Love the stickers! 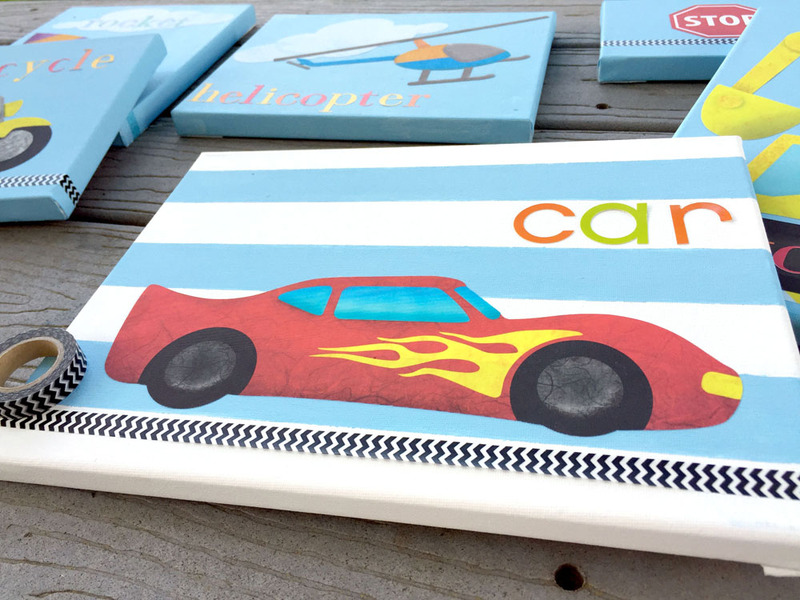 And the letters to compliment each vehicle – you’ve created very whimsical pieces – your little guy is going to be a great speller!! Looks so cute. Love the set up and those stickers look so nice! What a fun craft! The stickers are too cute! Thanks Mary 🙂 Yes, the stickers were awesome! These are so cute! And the washi tape is the perfect accent. Pinning the heck out of this one! 😊 Thanks so much for sharing at the #happynowlinkup! Such a fun idea! Makes me wish I had seen it about 7 years ago when all my babies were a little younger! My youngest is almost 12, so I think that ship has sailed, unfortunately.! 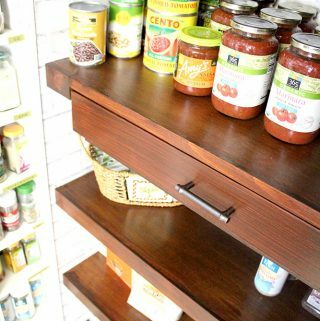 It’s a great idea and you did such a good job giving all the detailed instructions and pictures! These are so cute and they look super professional! Well done! I am in love with these! My little would go nuts to find a set of these on his wall! Awww thanks Stephanie! They were so easy to make! What an inspired idea! 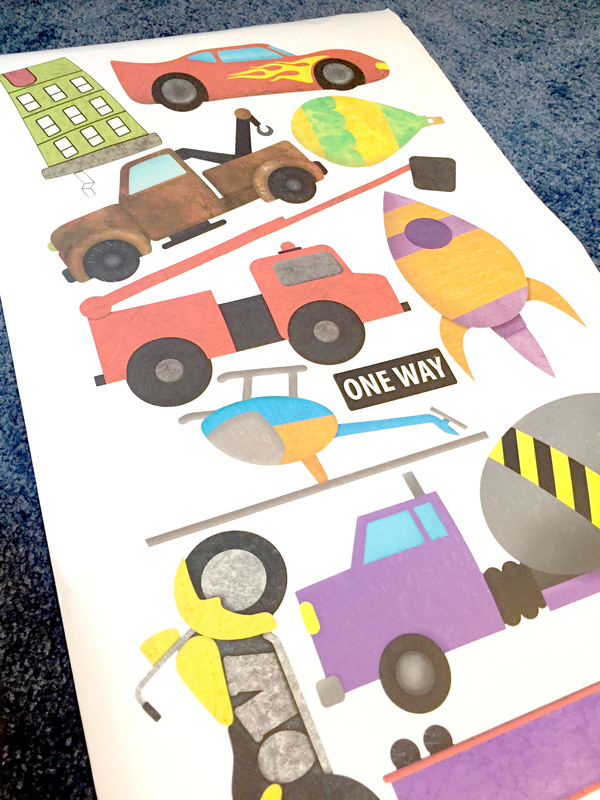 We love what you came up with in your son’s room. 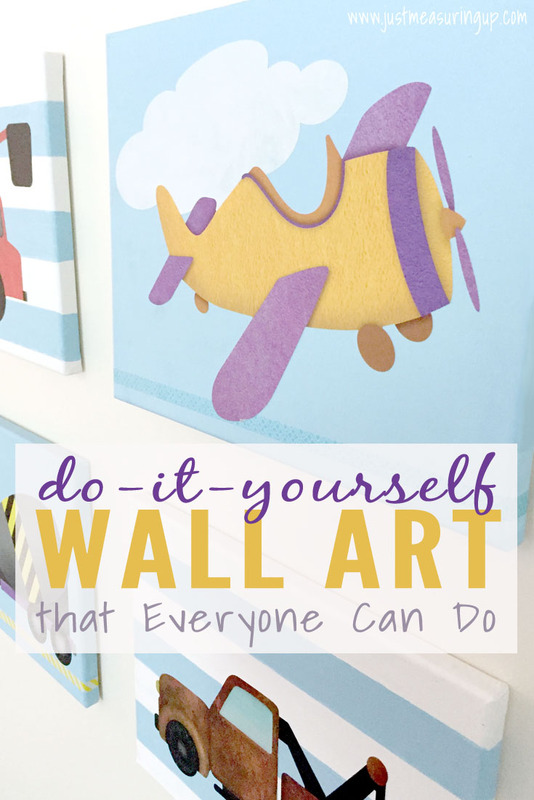 Thanks so much for allowing My Wonderful Walls to be a part of your awesome project! These are absolutely gorgeous! My boys would have loved them when they were younger! These look great! Super cute!! Great job, mama! Thanks Emily! :)) I love a good DIY project! So adorable and very creative! I love this art project! I’m obsessed with washi tape, can’t wait to see his finished big boy room. Okay, these are absolutely adorable!!! I love them so much. They turned out so well. DIY projects are my favorite. I much prefer them to store bought. These are absolutely darling! 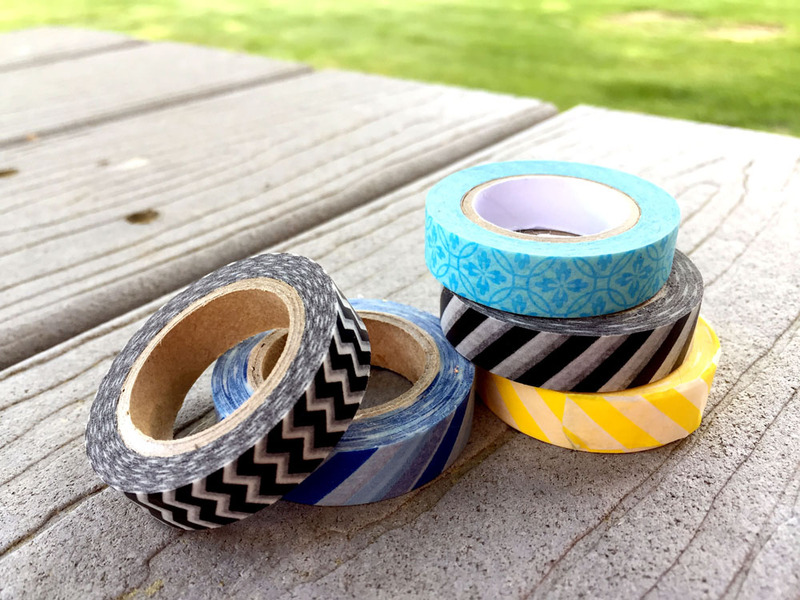 Clever idea to add the Washi tape. Thanks for sharing with SYC. I’m sure it’s not intentional, but I’m not seeing a link back to the party. 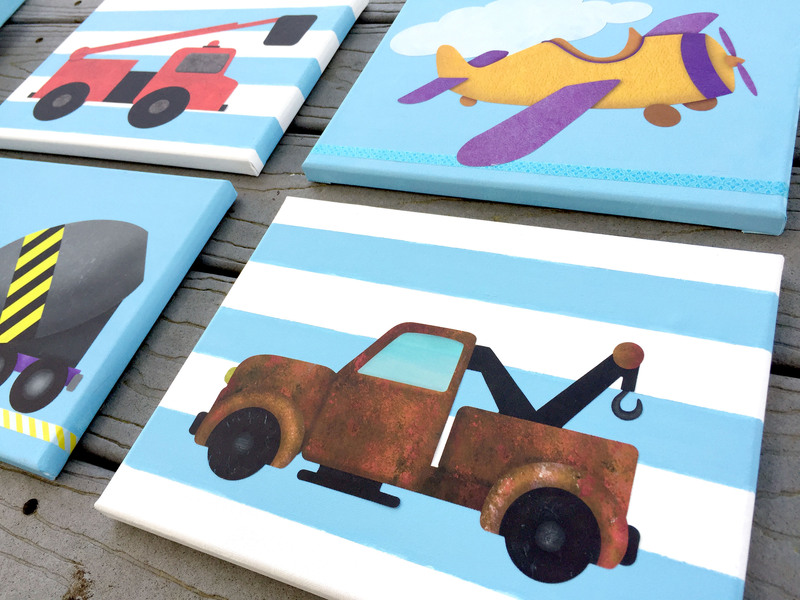 DIY artwork is the best and these are fantastic examples. Love how you put these together. Really cute and I love that they are for boys. What an awesome idea! This looks just like something you’d spend a lot of money on. i love the pictures. i love to diy as much of my decor as possible and never even thought to use stickers like these. Thanks Amanda! Yes, me too! My inspiration was the store prices and I loved that I found the stickers from My Wonderful Walls- they are so artistic! Thanks so much, Michelle! The rusty truck was my favorite too! You always leave the sweetest comments 🙂 Hope you are having a good week! I absolutely love this project. It looks easy enough for even me to do! I love DIY art projects! I think this would be perfect to ad a little bit of color and life to our walls! Yes, me too!! That’s the great part about he project – you can pick your colors:) New life to old walls is always fun! 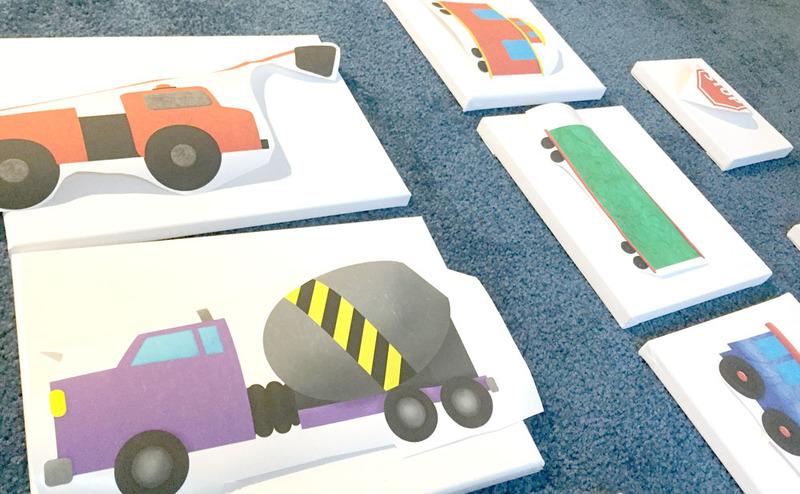 These look like soooo much fun to create with my kids! This inspires me to try and make a canvas myself. Oh all of these are super cute!! I love these designs! My daughter would love something in her room! Thanks for the chance!!! These are really cute!!! 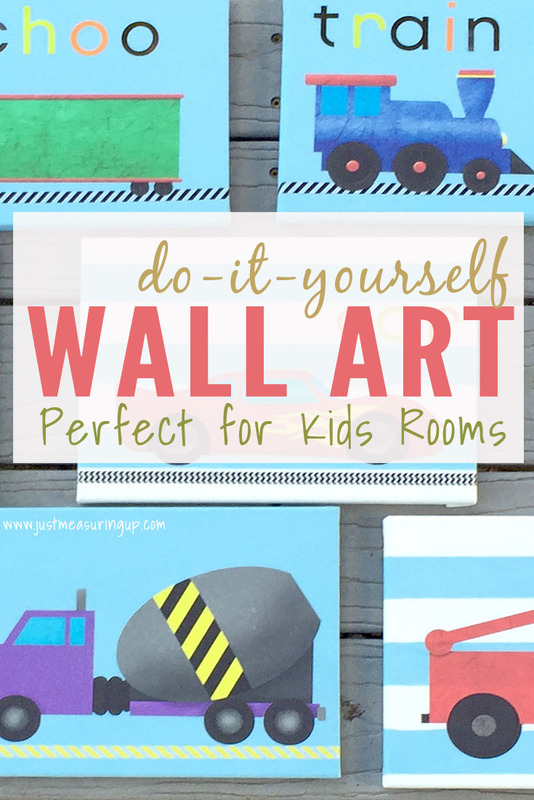 What a fun way to decorate the walls! This would be fun to do in my daughter’s room. That sounds great, Kathy! My Wonderful Walls had some awesome designs! 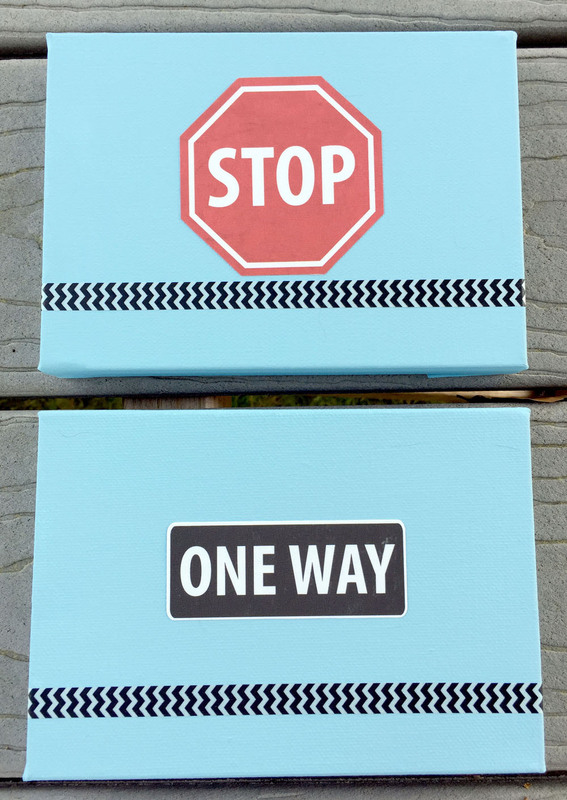 I love DIy projects, especially cute ones like this! Thanks Anita:) they turn out really cute! Very creative! My twins would love something like this but more girly lol. These are fantastic I plant to intergrate these ideas for my next craft project with my kids! Thanks Melissa! Hope they love it!! 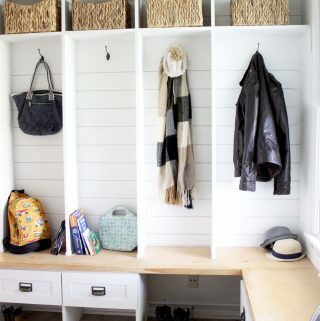 Oh I love this DIY! So many cute ideas. My youngest would love doing this with mom. My son would like the train picture.. I made him a sign when he was first born that said your first breath took mine away. These are so cute and an adorable idea! Thanks Marci 🙂 They were fun to make! What an awesome project. 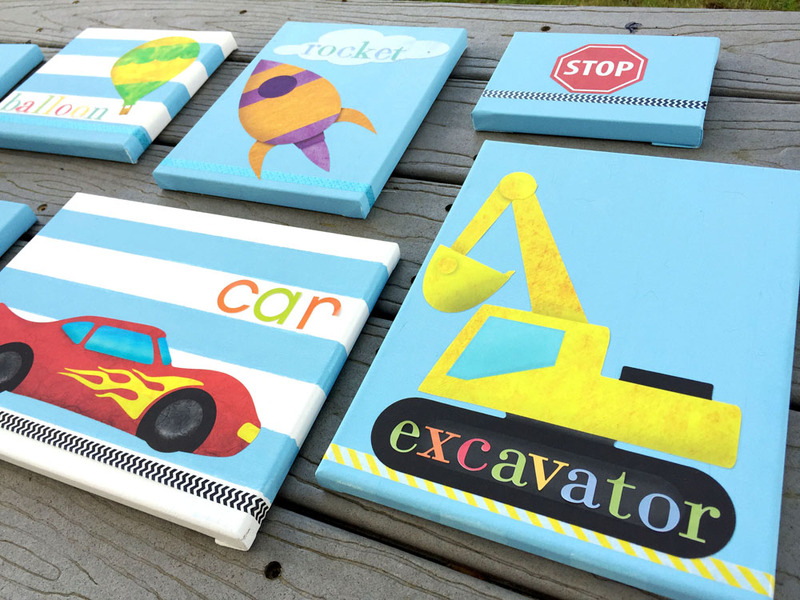 Your little one will treasure those boards for a long time. Just beautiful. Thanks Kathleen! :) have a wonderful week!